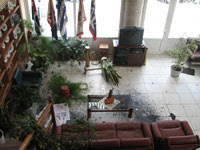 "The historic archive of Creta was targeted by vandalists in Chania, and all this in the day when the president of the republic Karolos Papoulias was there to celebrate the islands union with Greece. The perpetrators threw at the buildings facade, entrance and stairs bottles with black paint and oil" -from the mass-media. The days when the hungerstrike of the 15 immigrants without papers peak, only one week after the cease of the massive hunger strike of the prisoners in the penitentiary hellholes of this country, the city of Chania wears its "festive clothes" to celebrate the 95 years of the island's union with the greek state. Police will belt every corner of this city, the army won't forget to march, under the blessings of the local lords, priests and the "peaceful" local community. Disgusted by this filthy company we decided to act in the night, to profane on 1/12 with black paint the historic archive of Crete (property of the ministry of education) and attacking with sledgehammers and bottles with black paint the offices of the Union of retired officers of the Navy. There is nothing to respect from the symbols and the history of this old world. We only recognise the History and the struggles of the damned and the rebels, that have risen and rise against exploitation, repression and submission. Freedom will blossom through the ruins of this world. PS. Let the "responsibles" be aware that in case the immigrant hungerstrikers suffer from any irreversible health damage, our response will not just shock them but they will certainly miss their nights of sleep. -from an e-mail. (an older action in Chania from "Night Retaliation" can be found here http://directactiongr.blogspot.com/2008/09/series-of-attacks-and-communique-chania.html).